Nepal government formed Lukla Plane crash probe committee - Integration Through Media ....! 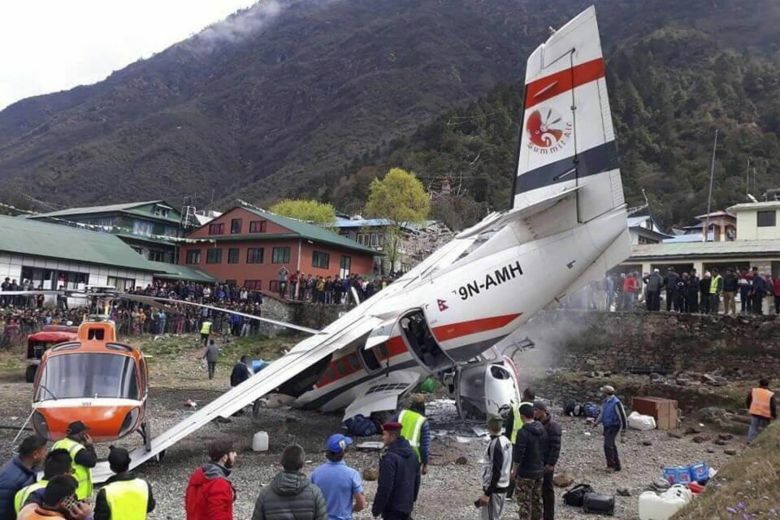 KATHMANDU: Nepal government has formed a committee to probe the Summit Air’s plane crash at Lukla-based Tenzing Hilary Airport in Solukhumbu on Sunday morning. Ministry of Culture, Tourism and Civil Aviation has formed the probe committee headed by former Director -General of Civil Aviation Authority of Nepal (CAAN) Rajesh Raj Dali. Members in the committee are Nepal Airlines Corporation’s engineer Rajesh Shrestha and Sita Air’s pilot Rabindra Dangol. Likewise, Joint-Secretary at Ministry of Tourism, Buddhi Sagar Lamichhane has been designated the member-secretary of the committee. Three people including two police and other four were injured in the crash that took place at 9.22 am on Sunday. The accident occurred when the 9N AMH Call Shine aircraft skidded off and collided with the parked 9N ALC’ call shine helicopter of Shree Air and Manang Air while taking off from Lukla to Ramechhap. Summit Air’s co-pilot Sujit Dhungana and Assistant Sub Inspector duo, Ram Bahadur Khadka and Rudra Bahadur Shrestha died in the air accident.